From the Heron Point clubhouse back veranda, a view of the peninsular 1st fairway and 18th fairway and green. I understand how golfers that have played the iconic Harbour Town Golf Links could overlook the Heron Point G.C. on the Sea Pines Plantation as just one of the “rest” of the courses on Hilton Head Island. 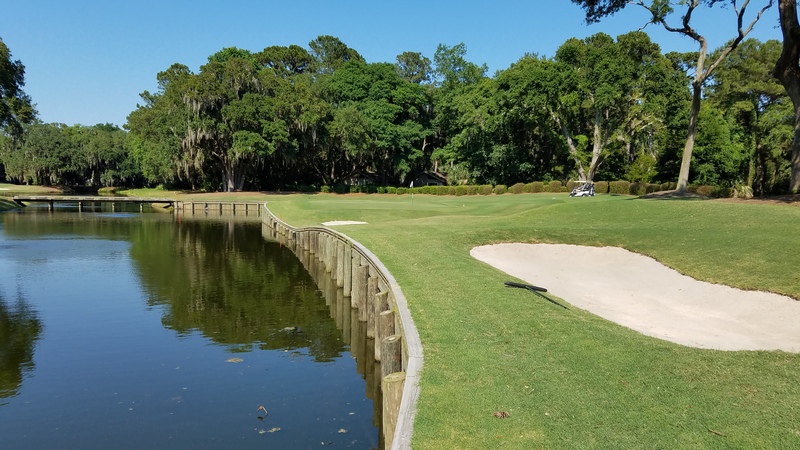 Heron Point lacks the breathtaking views of Calibogue Sound, the PGA tournament pedigree, and the immaculate conditioning that makes Harbour Town Golf Links one of the best courses in the world. However, I think a summary dismissal of Heron Point as just another indistinguishable, tree-lined Hilton Head course is unfounded nonsense. 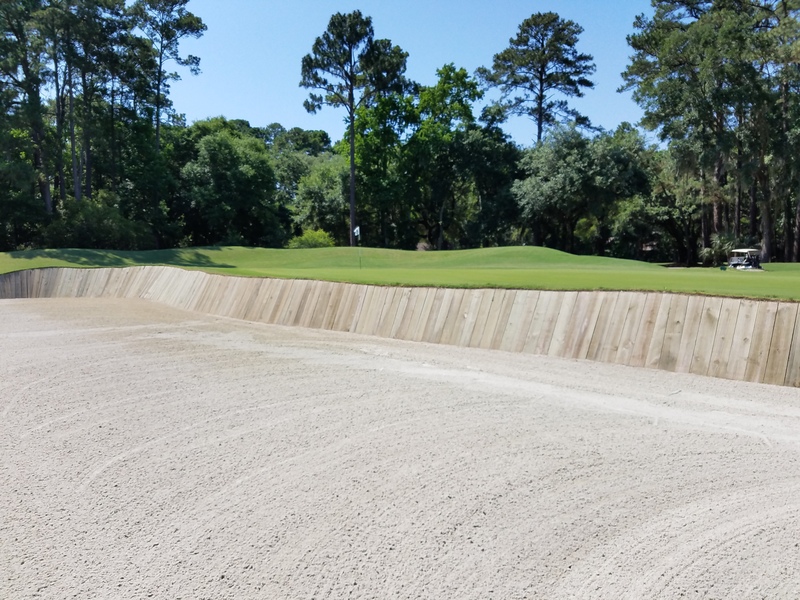 I have no knowledge of or point of reference for the course’s prior iteration, a George Cobb design built in the early 1960’s known as the Sea Marsh Course at Sea Pines. 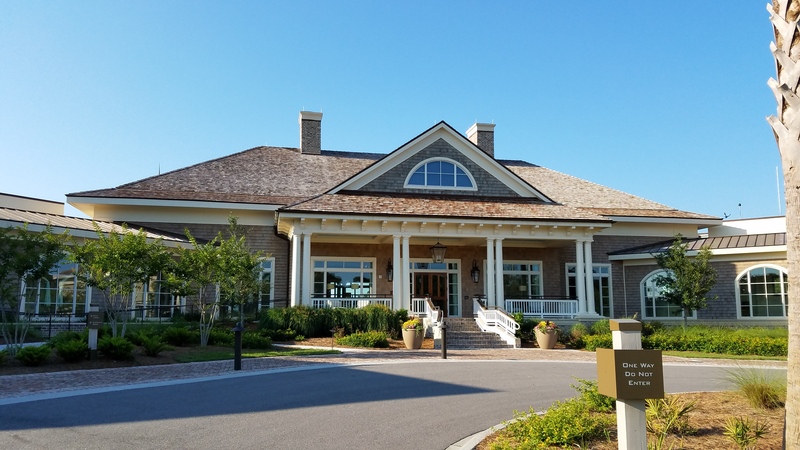 The sparkling new clubhouse serves both the Heron Point course and the revamped Atlantic Dunes course at Sea Pines. However, the Pete Dye redesigned Heron Point, which opened for play in 2007, is a remarkably fun and challenging golf course, replete with most of usual Pete Dye signature trappings that one would come to expect from the Hall of Fame architect, and well worth playing. What I didn’t expect to find at Heron Point was perhaps the most stunning, amazing clubhouse I think I’ve ever seen or been in. The brand new (circa 2016) complex doesn’t boast as grand of a view as Kapalua’s Plantation course, but its scale and finishes are every bit as luxurious, if not more so. Also, perhaps in a nod to Hilton Head’s origins as a natural sanctuary, the mammoth clubhouse complex is completely green, incorporating recycled goods and materials and green energy at every available turn. This photo captures just a portion of the massive Heron Point practice facility, with a green to the left and range on the right. On par with my previous experience at the Harbour Town clubhouse, the staff at Heron Point was incredibly friendly, accommodating, and professional in all respects (including letting a stranded golfer charge his phone on a staff member’s charger in order to call The Wife for a ride home). Thus, before even before setting foot on the first tee, there is a “Wow” factor inherent in the Heron Point experience. 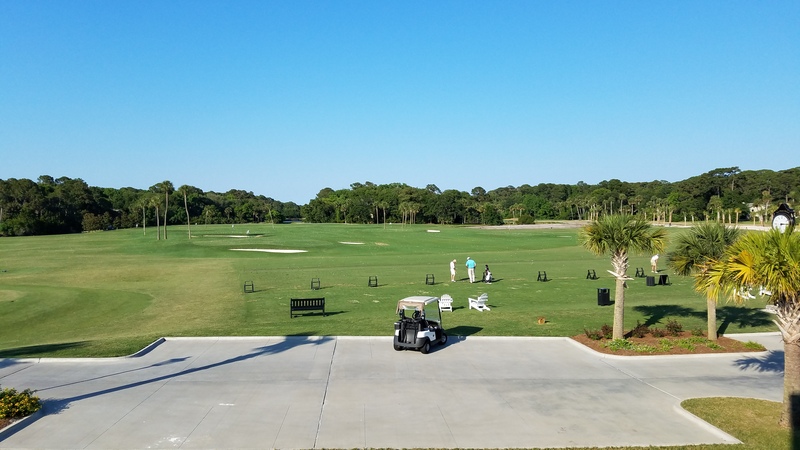 This feeling extends to the driving range and practice area, which was one the most elegant ranges I’ve ever visited, with its manicured tees, multiple level targets, and the feel of a great, wide-open space. Had I known that beforehand, I would’ve left the condo fifteen or twenty minutes earlier and taken better advantage of the facilities. 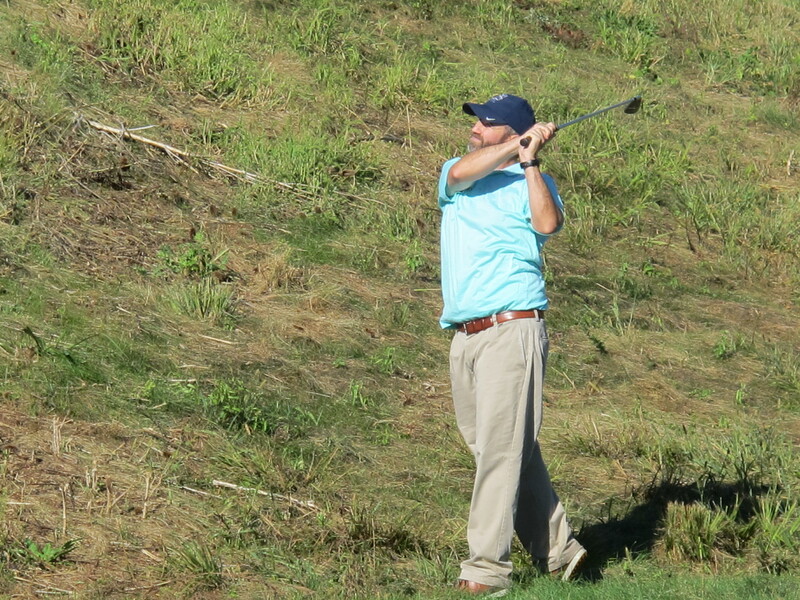 Standing on the first tee, I wondered if I shouldn’t just play my 2nd shot from the range. The course plays to 7,035 yards and a course rating and slope of 75.2/141, respectively, from the championship “Tournament” tees. I found the “Dye” tees, at 6,523 yards and a course rating and slope of 72.0/135 to present a much more comfortable challenge. 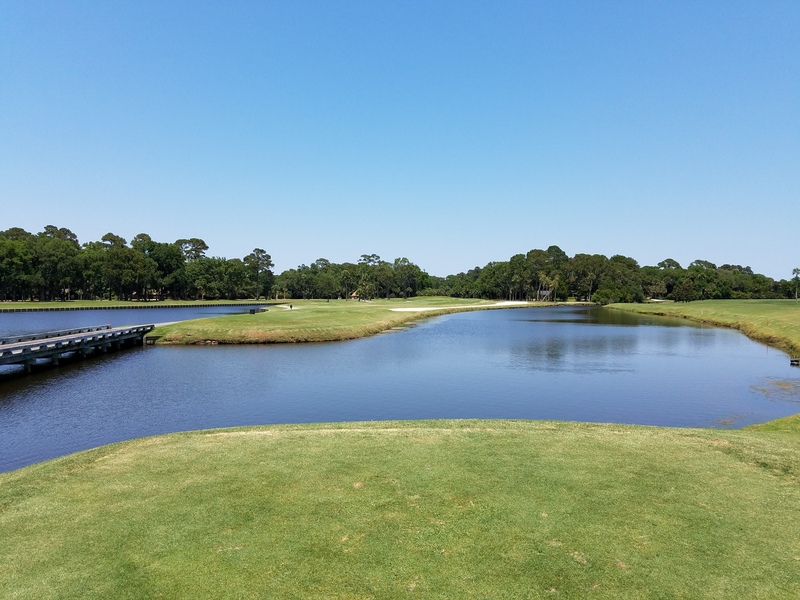 Once I reached the first tee, I was greeted by an exceptionally friendly starter and a beautifully manicured course that was certainly up to level expected at the Sea Pines Plantation. 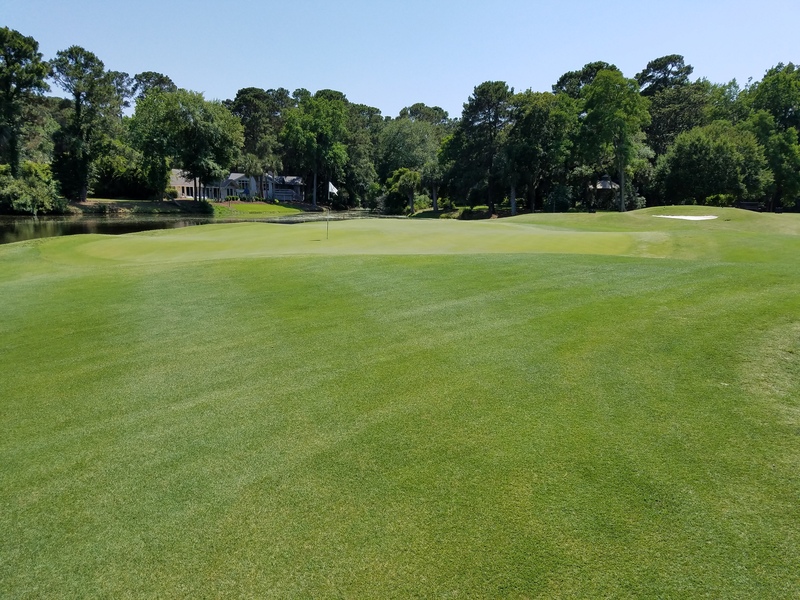 While there’s more native grasses and a Lowcountry feel to the scenery, the lush Bermuda grass playing surfaces were in peak condition in late May. Like most Hilton Head Island courses, the routing is carved from dense stands of pines and hardwoods, so there are limited scenic vistas, which I think Dye used to his advantage. The puddle on the left and the seemingly narrowing tree lines give way to a fairly easy 3rd hole. The layout includes the full catalogue of Pete Dye signature features. On the first hole, for instance, Dye uses a visual palate of water, sand, and angles to add a little tension and excitement to what should be an otherwise simple warm-up hole. 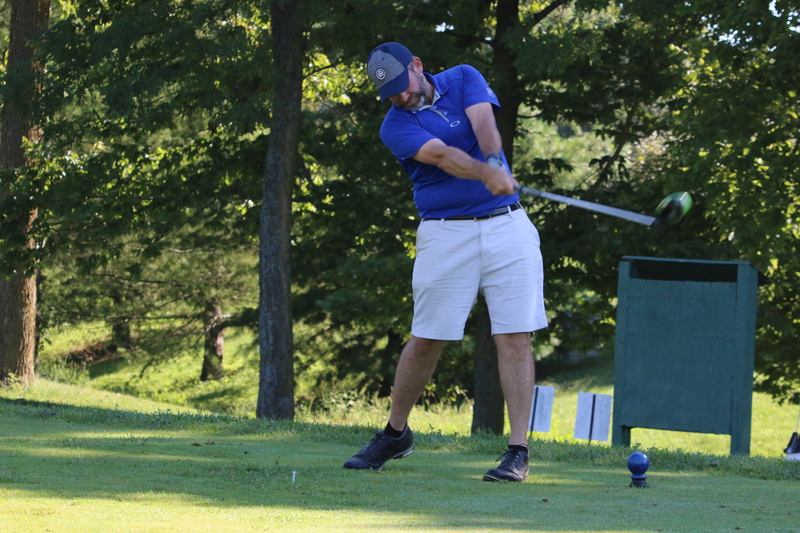 Dye waited all the way until the second hole to force a decision on whether to hit driver or trouble out of play with a hybrid or long iron (editor’s note: I chickened out and hit a hybrid off the tee, and proceeded to fan the pitching wedge that followed). Like many of the Dye courses I have played, the visual intimidation experienced on the tee is quickly replaced with a strategic analysis and decision on the on second shot. As one would expect, the greens at Heron Point are well-protected by tons of sand and numerous of water hazards. 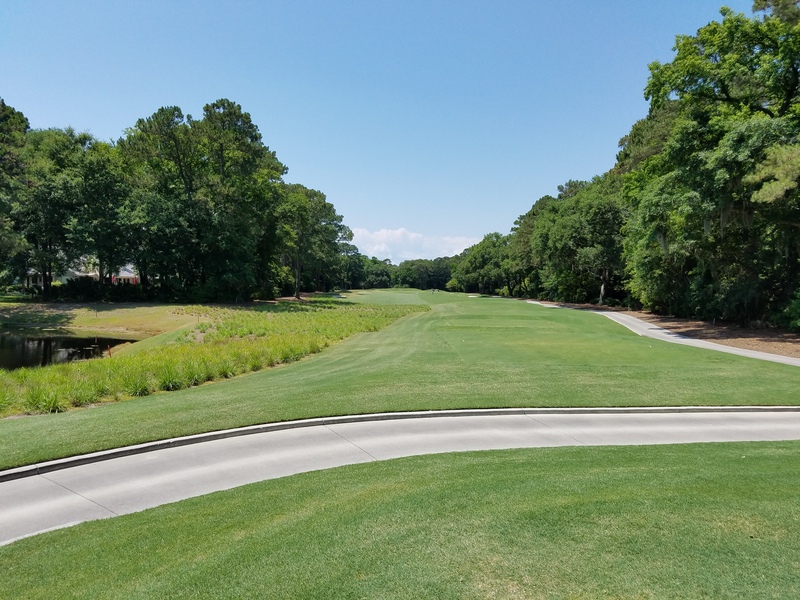 The sight lines and intrigue that Dye created with angles and hazards are all the more impressive given that the course is on perhaps the flattest piece of dry land on Hilton Head Island. Well hello 4th green, with your Dye-signature vertical planking keeping the green from sliding into the water. There were more than a few occasions when blind trouble spots, hidden to the uninitiated, swallowed my ball and chewed up my scorecard. 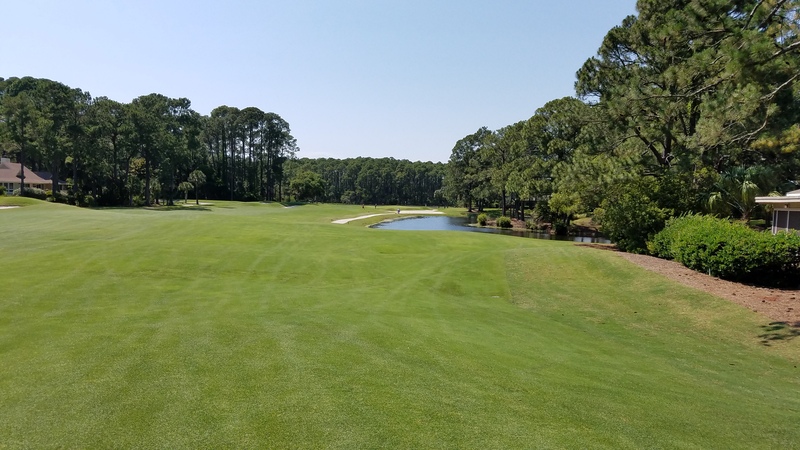 As would be expected on Hilton Head, Heron Point has lots and lots of holes with dog leg fairways, from slight to severe, that add both intrigue and difficulty. 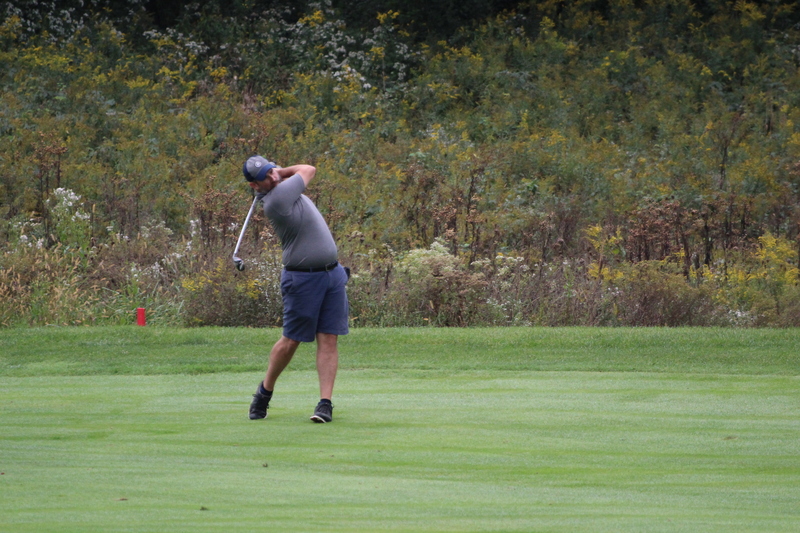 A couple of holes had what I would consider hard corners that forced a low-ball hitter like myself to hit to a target rather than challenge the dogleg. Thus, in order to play well, one needs to be able to move the ball not only laterally, but also be capable of manipulating the vertical trajectory of the ball from the tee, a challenge my links-loving 8.5 degree driver was not up for this particular day. Typical of more recent Dye designs, the greens at Heron Point are enormous, abounding with multiple tiers and challenging contours. The greens were plenty firm, but several rungs below a hockey rink. The 6th green, pictured here, provides an example of how water, sand, and contouring make approaching any green tricky. Most notably, the putting surfaces were fantastic, allowing for true, clean rolling putts, with a medium speed that was appropriate for such anfractuous greens. Perhaps one of the most disappointing characteristics of the course was that the “ground game” doesn’t work at Heron Point, except in the short game in the immediate vicinity of the greens, because all of the greens are expertly protected. 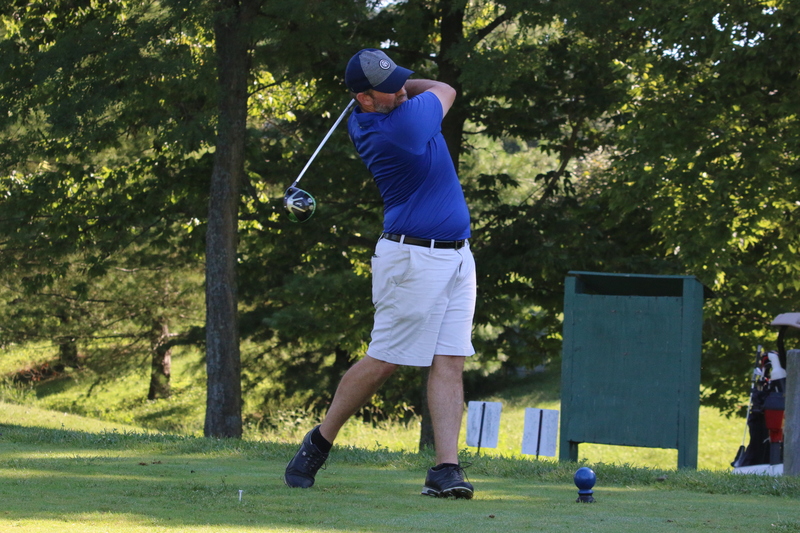 There’s no way around it, the course requires golfers to put the ball in the air, as the opportunities to run the ball onto the greens are few and far between. However, if the green is missed by just a little bit, there are plenty of opportunities to chip or bump-and-run with great success. There were only one or two places where I missed the green that required a high pitch or flop shot. Fortunately, the sand in this massive bunker on the par 3 7th hole was in perfect playing condition. Thinking back on Heron Point, I only remember a few holes vividly, which despite the overall high quality of the holes, makes me think there may not be a signature hole or stretch for the course to hang its linchpin upon. The aforementioned first hole requires cracker jack nerves for its tee shot. The 18th hole shares the lake with the first hole, but it’s a whole easily recognizable to anyone familiar with Dye’s work. It’s a right-to-left bending, medium length par four with water guarding the left side of the fairway and green, making the tee shot a risk/reward stage setter. It is essentially the same hole as the 16th at Kearney Hill, the 18th at Paiute’s Sun Mountain, and essentially the 18th at Harbour Town. I did enjoy the par 3 holes, as each presented a quintessential element of Pete Dye design: the 4th hole with its vertical timbers restraining the green from descending into the pond, the 7th hole with timber planking supporting the raised green and bowl complex above the enormous bunkers, the short, pot-bunkered 13th hole, and the uncomfortably long but relatively accessible 16th hole. Standing in the 9th fairway, I’m not sure where I would’ve rather placed my drive. I do remember individual shots from Heron Point, specific risk/reward calculations, and what shots gave me pause as a result of the clever architectural features. There were plenty of obvious hazards, some that looked worse than they really were, and several that jumped up and snagged my game without warning. I also remember being insanely mad that my second shot on dogleg right, par five 17th hole ended up in a pond that I couldn’t see from the tee and didn’t know was there until it was too late. The bunkering was fantastic, as was the condition and quality of the sand in those bunkers. All in all, the Heron Point course is just a really nice golf course, even if its most spectacular feature is its clubhouse complex. How many Dye-isms can you spot? Water guarding entire side. Vertical wooden planks. Pot bunker. False front with bunker. Multiple tier, sloping green. And this was a par 3! 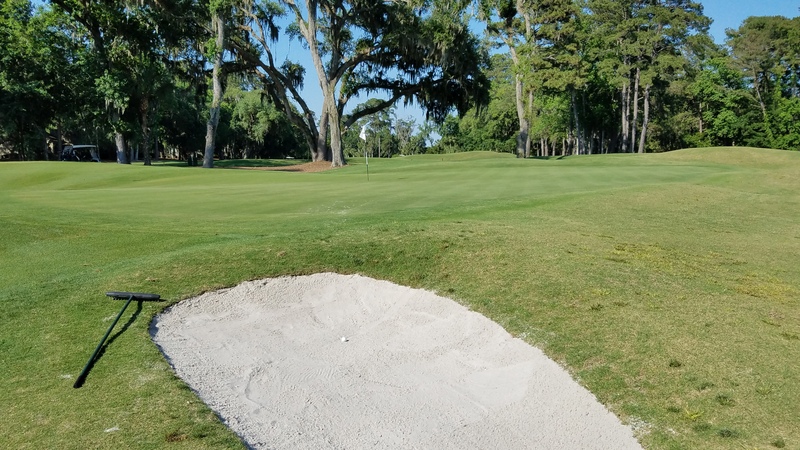 The green fees are on the high-end of non-Harbour Town pricing on Hilton Head Island, but it’s not grossly overpriced relative to the other courses on the island. 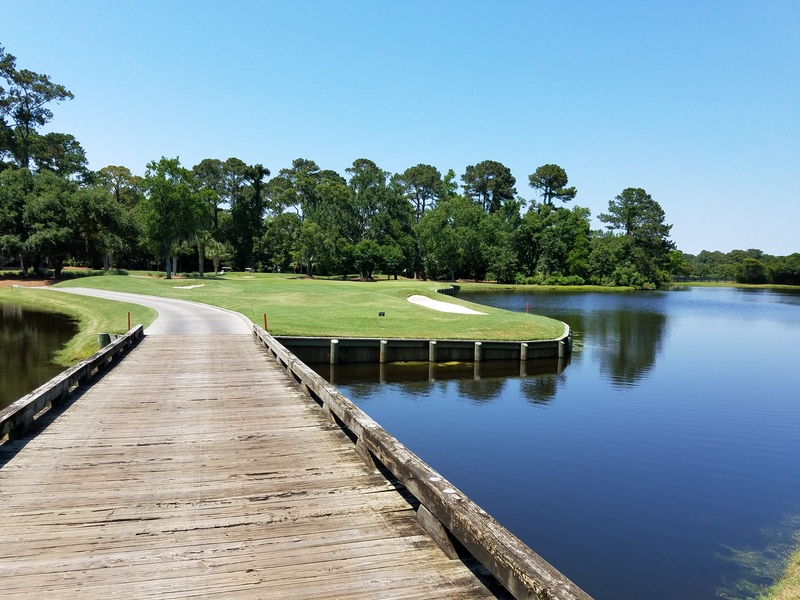 I would certainly rate Heron Point’s quality as on par with the Robert Trent Jones Course at Palmetto Dunes, though the lack of a view of the Atlantic Ocean or Calibogue Sound is conspicuous. One of the bonuses of Heron Point’s routing is that from the second tee and my misplaced approach shot into the 18th green, I had fantastic views of the grown-in on the revamped Ocean Course, a new Davis Love III redesign that I’m excited to see in the spring of 2017. 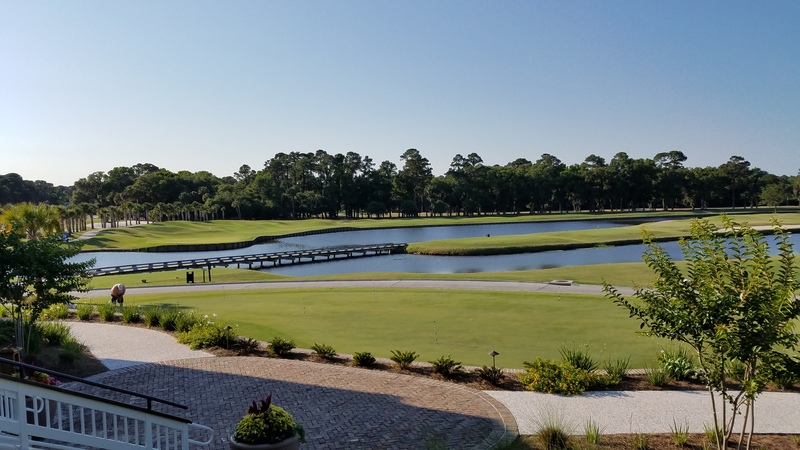 The bottom line of my visit is that Heron Point is a really nice golf course that offers incredible amenities and outstanding service at a premium but not relatively outrageous price. I could scarcely believe I hit a ball into a short-side bunker on the 15th hole that was no more than 70 square feet in area. Is it bucket list material with so many other options on Hilton Head and the surrounding Lowcountry? Probably not. But I would certainly play it again at the twilight rate, and probably will during some future Island visit. 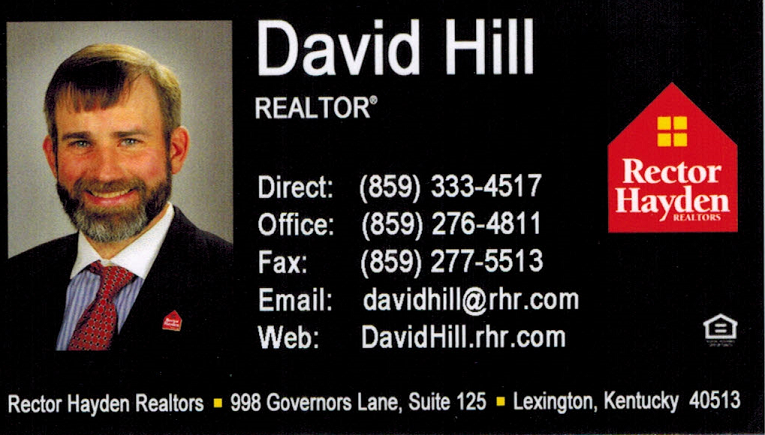 Dave, nice review. What were the regular and twilight rates? Thanks Brian. Looks like $170/150/120 for morning, afternoon, and twilight rates during the peak spring season. 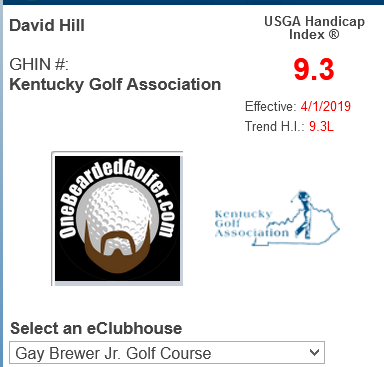 I think I had a coupon code from the Louisville Golf Export that made it more reasonable.